The owner of this 1995 HR42F decided to do something similar as I did with Regina Laska and had her completely refitted by a professional yard in Italy, BlueRefitting, specialised in refitting of prestigious boats, such as Swan, Hallberg-Rassy etc. He was so overwhelmed by the result that he now plans to do the same once more, but this time with a bigger HR boat. For this reason, he is offering his refitted HR42F that has just been finalised on the market. 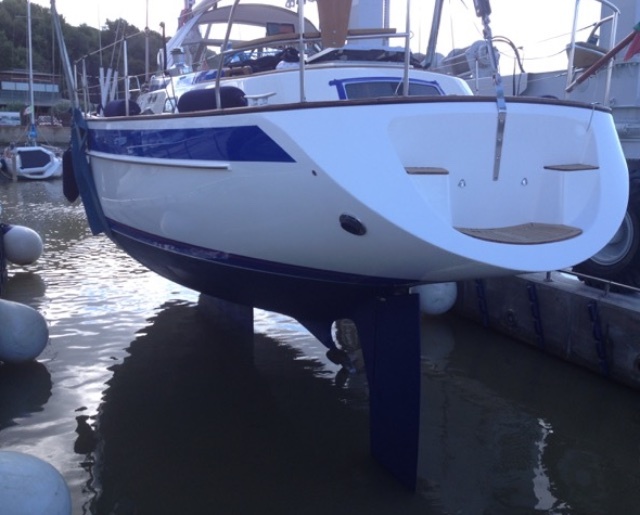 The boat got ready in October 2015 and is now for sale, in an excellent condition with all major parts either having been serviced or replaced. The boat is lying in Italy and the price can be given on demand. Please note that this boat has slab reefing and no inmast furling system, which some prefer, others don’t. All instruments completely new (Raymarine) incl radar, plotter etc.